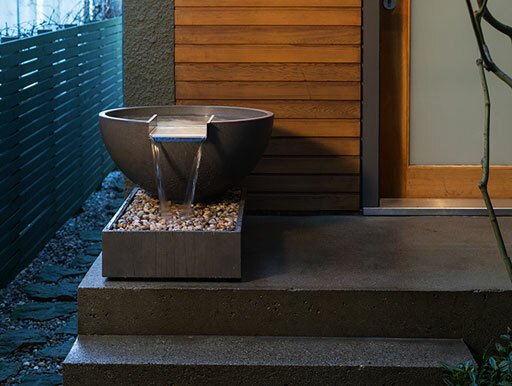 These clean lined, self contained water features make it simple to integrate flowing water into your environment. 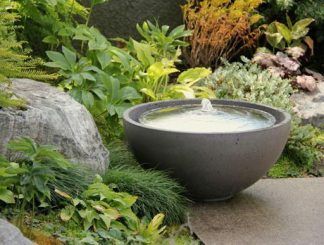 An adaptation of our Scupper water bowls this version combines two concrete vessels to create a simple, self contained water feature. As with our original Scuppers, clean edged, mechanically formed metal and smooth concrete are brought to life by the liquid movement and pleasing sound of water. 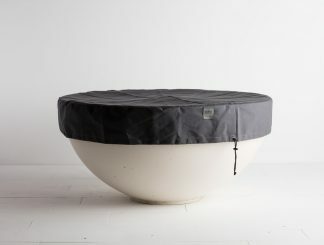 The hemispherical bowl fills with water from a central hole in its base, creating a deep pool that spills out through the reflective channel of the scupper into the basin below. Polished metal and pooled, cascading water combine to create interesting reflections as light plays over their surfaces. Handcast concrete vessels provide a solid sculptural counterpoint to the fine edges of the scuppers and the moving water while functioning as impermeable containers. These water features can be used in any level location that has access to a standard electrical outlet. Appropriate for residential and commercial installation indoors and out. Solus water bowls are designed to be experienced first hand. We invite you to watch our water bowl video below to get acquainted with them. Brass, stainless steel and copper scuppers. Scuppers are treated and sealed to maintain their bright finish. Brass and copper parts can be left unsealed by special request. Please see our user guides and reference videos for specific part information. Large river stones (5) for moderating water in-flow. Each of our water bowls is hand cast from high performance, fiber reinforced concrete which has been tested to ASTM standards. All concrete pieces are sealed with a penetrating sealer to minimize weathering. Metal surfaces are electro-polished and or treated with a reversible protective coating to maintain their polish and protect them from the elements. Locally made scuppers are treated and sealed to maintain their bright finish. Stainless steel, aluminum and PVC component parts. German designed, Italian ,made pumps with variable water flow control. Assembled by hand and tested in our Vancouver facility. Each of our water features comew with a warranty on workmanship and performance. warranties are extended with the purchase and use of one of our All-Weather covers. 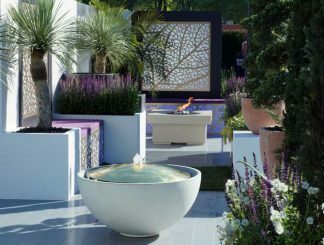 Solus Water Features are available direct through Solus to both homeowners and the trade. All water features are individually wrapped and crated in museum quality crates to ensure that they arrive to you in perfect condition. Orders within the greater Vancouver area are individually wrapped on pallets. She gladly chased up any queries I had and got back to me when she said she would. The product itself is stunning and really complemented my project, it arrived blemish free and on time. 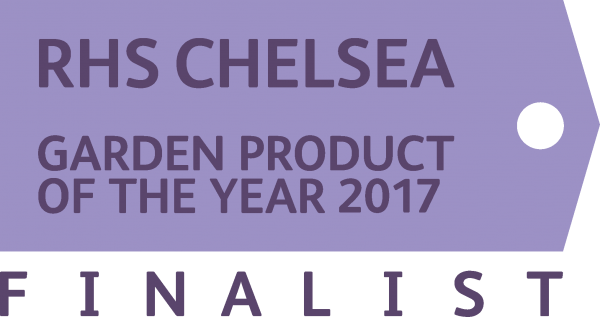 I’d like to say a big thank you to the team and would highly recommend them to anyone with decent taste. I am currently workin on a new project and am working with them again.